Availability of green leaves depends upon its regional and seasonal parameters. The colorful wrapping paper along with the ribbons can be reused for decoration. Anthuriums are also known as Painted Tongue, Flamingo Flower and Hawaiian Heart. 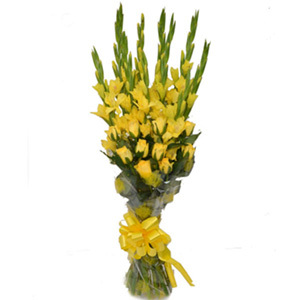 Flamingo flowers are popularly used as hospitality gifts. 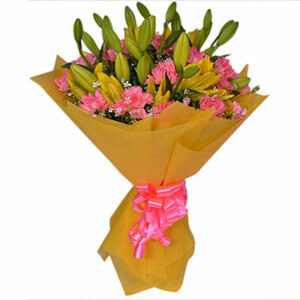 Oriental Lilies are one of the top ten flowers in the world and is a popular choice of gifting. No matter whatever the occasion is, a bunch of flowers are lovely gifting options. If you are looking for a bouquet of flowers this is the bouquet for you! 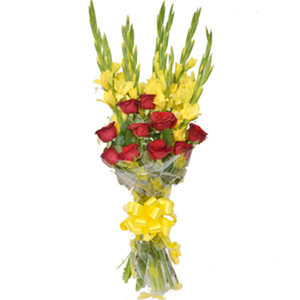 This bunch gives a special sense of charm and your recipient is sure to be very impressed by your gift. 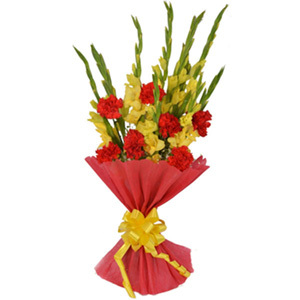 So place an order for this bouquet now!